For vibrant color documents and expandable paper-handling capabilities, choose the HP Color LaserJet CM4730f MFP, with an input capacity of up to 1,600 sheets as well as color laser printing, copying, scanning and faxing. The HP Color LaserJet CM4730f MFP expands on the performance and output quality of your office by offering the ability to get more done at one high-powered machine with loads of functionality. 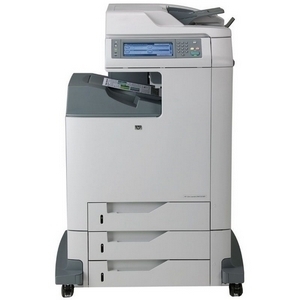 The MFP also offers an intuitive interface, easy troubleshooting and other convenient features. HP color management tools help to save ink and money by enabling you to control who in your office uses color and when. Print short-run color documents in-house, quickly and affordably. Make copies, faxes, scans and prints quickly and easily. If you want brilliant print quality that exceeds your expectations every time you print, get your HP Color LaserJet CM4730f MFP. Docujment and Media Handling Min Original Size 3 x 5"
Max Original Size 8.5 x 14"